They call a spring snow “poor man’s fertilizer” because the flakes pick up nitrogen from the air as they fall, and then melting quickly, deposit that element into the soil. Thanks for trying to save me money, Mother Nature, but really…at this time of year I’d just as soon have warm weather. If my soil is a bit less fertile as a result, so be it. I am so ready for the growing season. Ready to plant peas and lettuce, start seeds in the shed and succumb to impulse purchases at nurseries and on line. I want to be patient with those things that I have no control over, I really do. I strive to be serene in the face of timing, weather, and other people…but there are times when crankiness overrides my best intentions. The pansies that I planted last week seemed indifferent to winter’s last licks. They are not harmed by the snowfall, and seem to be waiting patiently for an opportunity to grow. OK, pansies…what’s your secret? 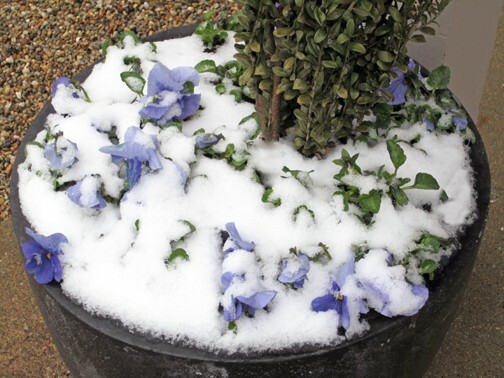 I know that snow insulates plants, so these pansies may be better off covered with the white stuff when the temperatures fall. But really - how do they stay so cheerful looking in the face of such cold, raw weather? 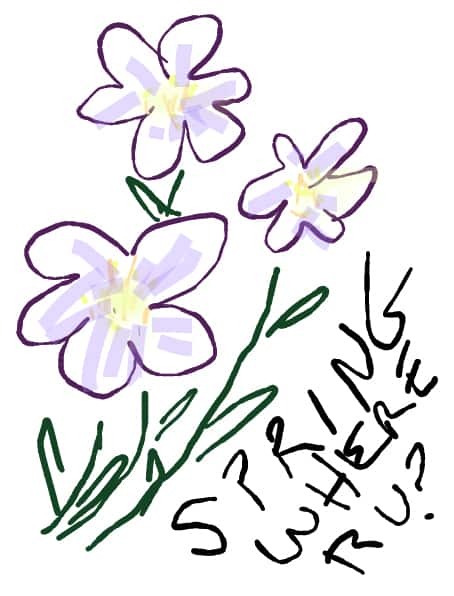 I find myself doodling notes to Spring on my phone. Anyone have her email or phone number?